We are actively looking for dealer/distributor/applicators nationwide. Hawk Seale performs in all climates, it prevents cracking and deterioration, also stops damage from freeze-thaw cycles. Enhance and separate your sealing service from the the "traditional topical coating" products that make pavement look nice, but do little to preserve the life of pavement. 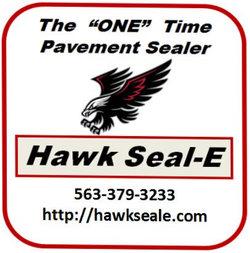 Applying HawkSeale "one time" will stop the cracking and preserve their asphalt and keep your customers happy. Your business reputation will be enhanced and increase as your customers see the difference. Whether your new to the pavement industry or experienced we would love to visit with you about Hawk Seale preservative. Be sure to watch our tutorials and let us help you increase your business with Hawk Seale. Use the form on the right to contact us by email and let us know the best time to contact you, or call us direct.